Glass is a great option due to the all natural composition, there is no chemical interaction between your product and the glass packaging. The clarity also creates great shelf impact and allows customers to see the exact product they are purchasing. These clear glass vials are paired with black mini fine mist sprayers and clear styrene overcaps. 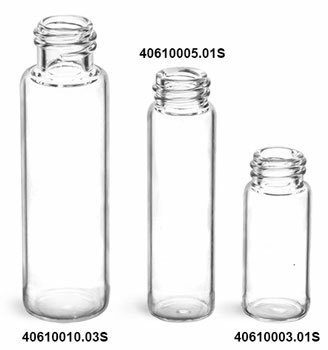 Available in 3 ml, 5 ml, and 10 ml sizes, these glass vials could be a good option for packaging products that should be applied by misting such as breath fresheners or body sprays. 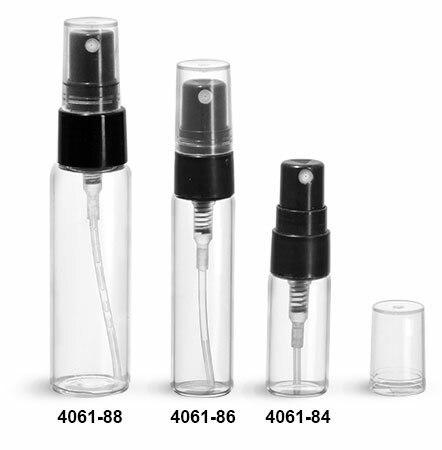 Be sure to test your product with these vials to ensure proper compatibility.